Healthcare 2025 will see competition converging around 2 critical success parameters: access and outcomes. Improved access to healthcare and outcome dependent payments will both have significant impact on the cost of healthcare. Technologies like IoT, AI, and analytics are enabling remote diagnosis and continuous monitoring, eliminating trips to the hospital. Doctors will be able to immediately intervene and tele-consult if a threat vector is detected in a patient’s vitals data. Virtual clinics with integrated medical devices will also make primary healthcare available, even in under-served places, at a fraction of the cost. Care providers, and consequently patients, will spend lesser on care delivery infrastructure and equipment. A lot of the doctor’s work, such as evaluating reports, will be automated. An empowered team of care managers will become instrumental to the care process, allowing doctors to focus on delivering specialized care. Data and analytics will shift towards personalized care. It is difficult to argue against platforms that will use patient data to create on-the-fly personalized care plans with built-in coaching algorithms to ensure compliance. Outcomes will be more in focus than ever, with providers getting paid or penalized based on re-admissions. We anticipate a domino effect of transparent pricing across the board, from drug makers to device manufacturers to providers, all based on shared patient data. Platforms like PatientsLikeMe are already accomplishing some of these goals, based on democratized clinical data that has been willingly shared by patients. 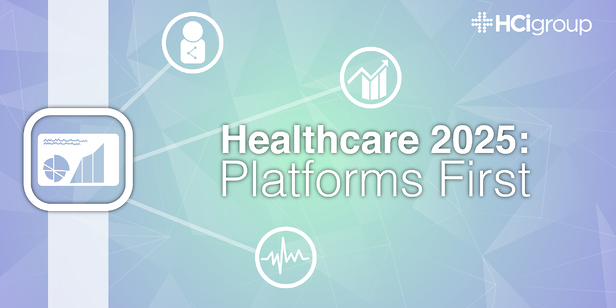 Healthcare 2025 will be delivered through integrated ecosystems, or platforms. Specialized digital healthcare platforms for care delivery will offer patients a seamless care experience, equipping them with the ability to acquire vitals data constantly through wearables. The platforms will embed Artificial Intelligence and healthcare analytics to predict, coach, advise, alert, or schedule with zero to minimal intervention from doctors or care managers. Combined with population analytics and genomics, technologies such as AI and analytics will better predict healthcare risks. Platforms will also encourage healthcare consumers to favor prediction, prevention, and proactive interventions. Post-treatment monitoring to ensure adherence to follow ups and prescriptions will lead to better outcomes and improve care quality, even while reducing re-admissions, hospital acquired infections, or visits. While it is hard to define what a successful platform will be, we can venture a few guesses on what they will do. Successful platforms will be built for data sharing, interoperability, and inclusivity. The platforms that can support the management of a broad spectrum of conditions will have an advantage. Equally likely to succeed are platform that are purpose built for specific conditions (such as cancer). Adopting a broad-based approach will also be critical. How many medical devices can be readily integrated? Does the platform include on board a bevy of drugs, care providers, pharmacies, etc.? Can services, such as test and consultations, be seamlessly requested and delivered through competing partners? The ultimate test is, of course, scale. Digital healthcare platforms create a unique opportunity for average healthcare consumer, gain from expertise, community, and access from around the world. However, the ability of medical device manufacturers and pharma companies to leverage these platforms will be tested. Med devices and pharma companies operate under diverse standards, regulations, and governing bodies for different geographies. Their ability to build, test, localize, and market quickly will be particularly important for scaling in the digital world. Establish an Innovation Council, with a Chief Innovation Officer, tasked with creating a long term roadmap for the digital world. Identify Partners, especially for IoT, AI, analytics, along with traditional domain partners. Listen to the healthcare consumer by developing ways to gauge behavior and collect data to build unique, connected experiences. Stay tuned for a “Decoding Digital Healthcare” webinar with Tech Mahindra on December 12, 2017, where we share our vision for Healthcare 2025, and how the healthcare ecosystem can stay ahead in the race!